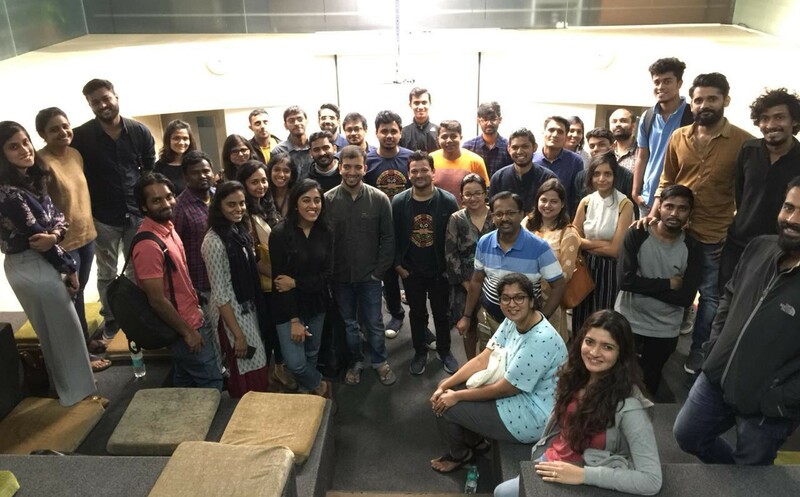 On 25th November, HelloMeets organized a meetup with Supriyo Roy, Design Manager at Flipkart. 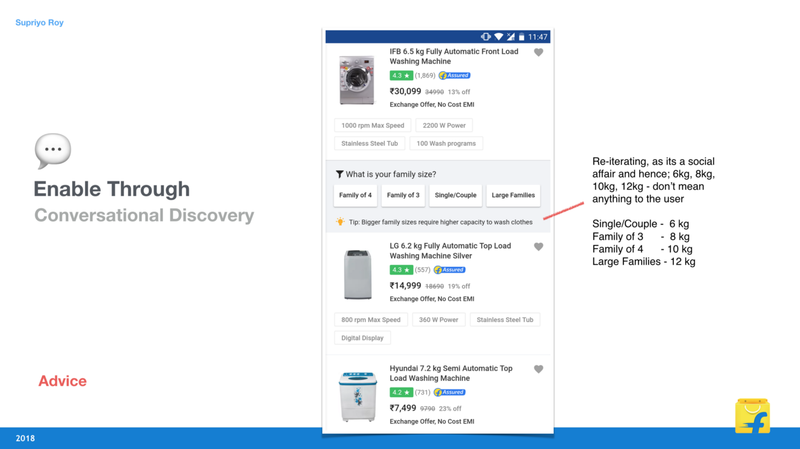 Supriyo played an integral role in the evolution of Flipkart’s consumer shopping experience. 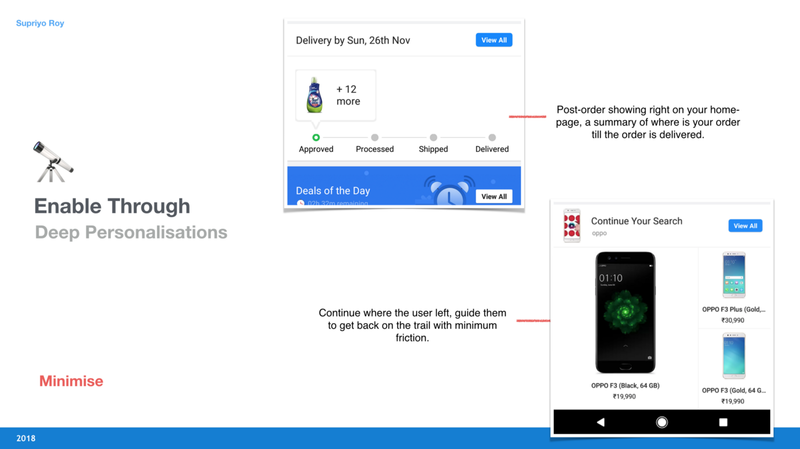 In this design meetup, he took us through a journey from understanding the design process that goes into building a successful user journey for E-commerce platforms to learning design hacks to retain customer interest while shopping. He shared how Flipkart has been building “unique shopping experiences” online for each of their offline counterparts. This is very crucial, especially in India where the population is so diverse in terms of geographic, demographic and socio-economic aspects. Supriyo stressed the importance of viewing the customers, not as a generic faceless “user base”, but rather fostering personal relationships with communities. 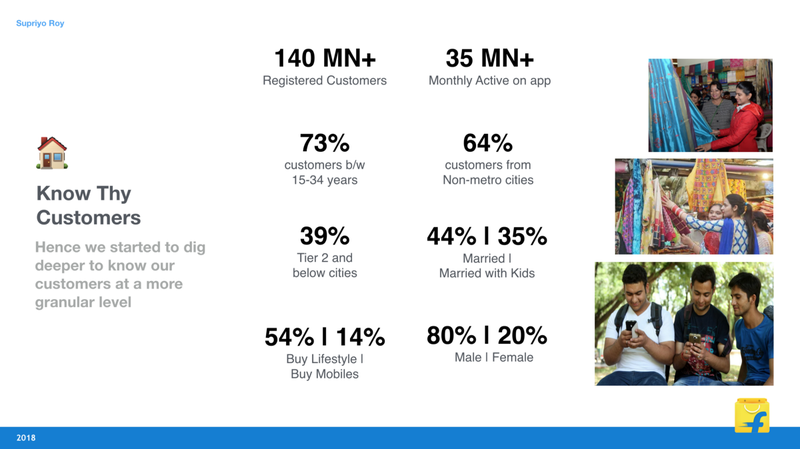 Flipkart found out that a majority of its prospective customers resides in non-metro cities (with a population less than 5 million) with a plethora of cultural and societal nuances which they had to cater to. Take a look at the above image. 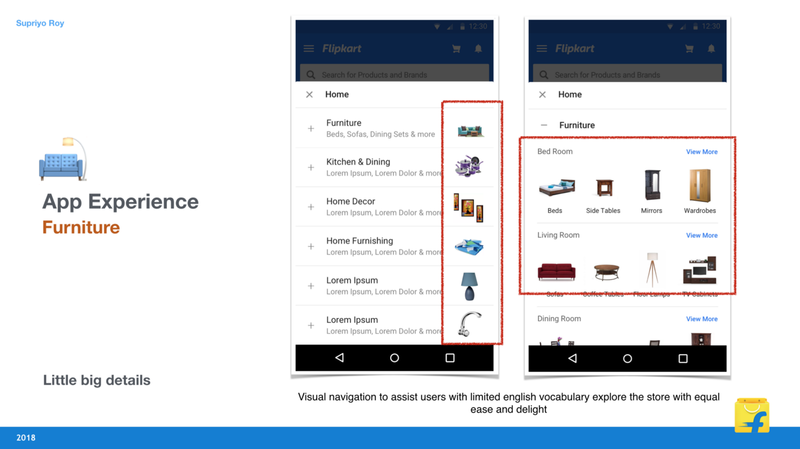 It gives an idea about how Flipkart team went deeper in doing the research for their “user base”. 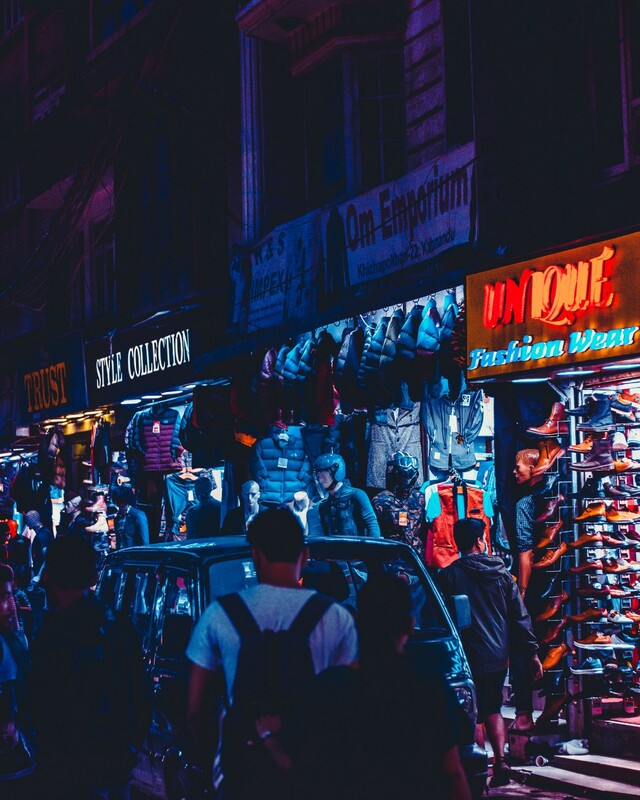 Replicating the offline shopping experience into online is a challenge. There is an absence of the space, an absence of an assistant that you get in a shop or mart which adds up to a really good experience. So, understanding the needs of your customers is very important to give them the same shopping experience online. A phone is an integral part of users life. Storage is limited and precious in the phone so not just any app will find space unless it adds meaningful value to people lives. That is where frequency and value of usage come in. Any action of the user on the app should not cause the phone to hang or over-heat or they will avoid it. 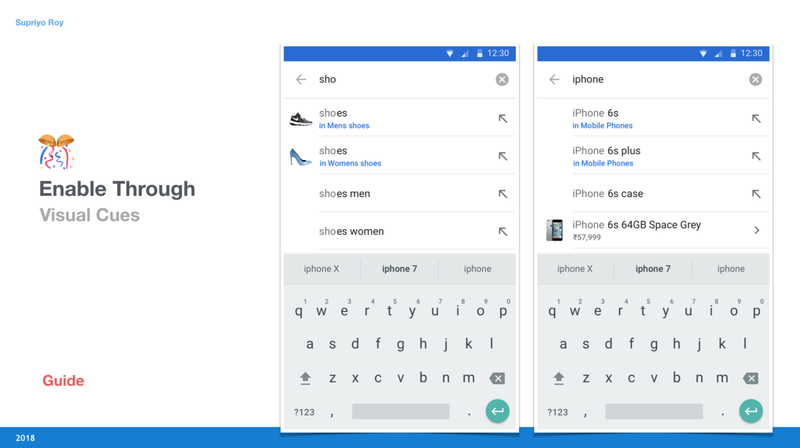 Our phone itself comes in English as built-in language, people are now familiar enough with it to understand how to use basic features but this is not true for Apps. Every app is installed separately, so if complicated jargons or vocabulary is used, people will give up on it. Preference should be simple and easy to understand words. In terms of language, it is important to play safely in apps. 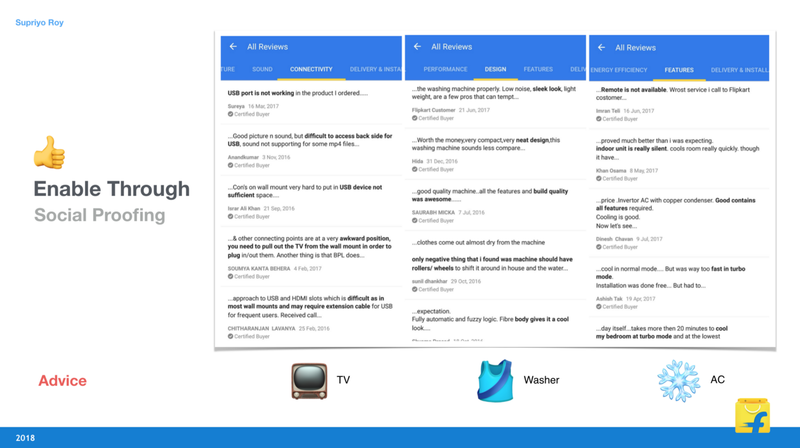 Discover: Users enjoy discovering and exploring what is new in the market. Proof, Certainty, and Trust: Customers desire proof and certainty of security of exchange, return and refund when it comes to online shopping. Offline Shopping offers proof, certainty, and trust but is too exhausting and time-consuming. On the other hand, online shopping saves time but has uncertainty related to the product. 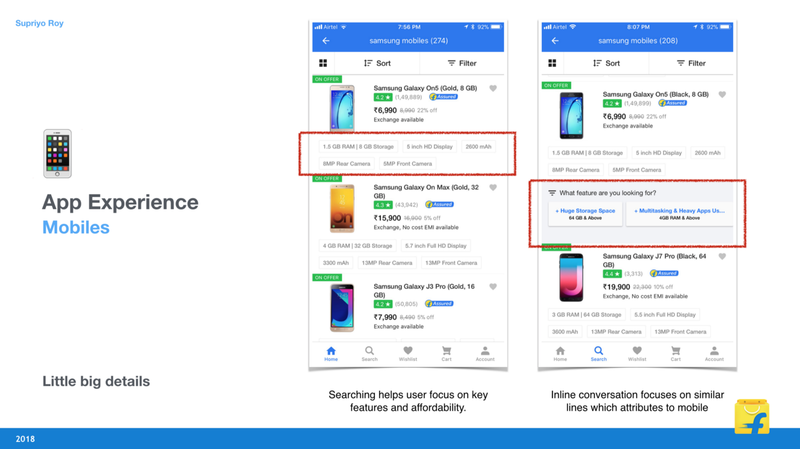 Flipkart design team visited real shops, both small and equipped ones and tried to understand how different categories of products are bought. Mobile and other electronic appliances are recurring purchases in one or two years. So customers are extra cautious and they have these questions: Is Processor Good? Does the camera take good pictures? How long Battery lasts? How it is better in comparison to another model? Fashion is all about updating personal self and being trendy. So queries here are like: Will it fit well? Is material good? Will colors wash away? Furniture has a longer buying cycle and customers buy it visualizing that how it would look in their room or home. So in furniture shopping, personalized communication plays a good role, where shopkeeper builds an interpersonal relationship by giving a guarantee, discounts, delivery and installation perks. 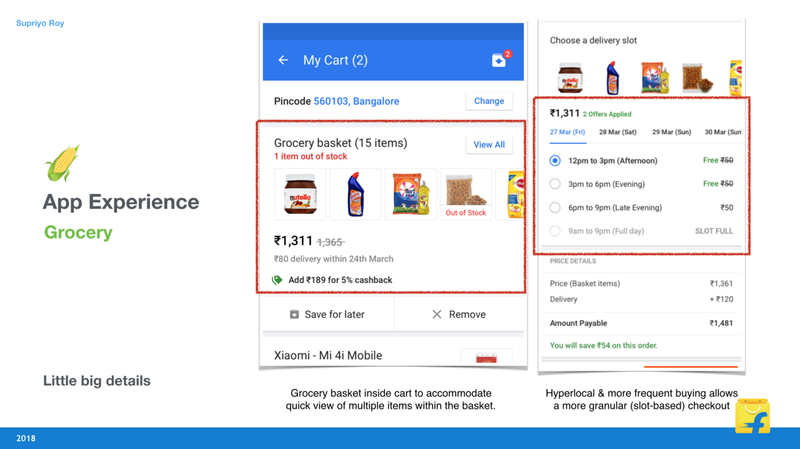 Grocery requires a very different research activity because Grocery shopping is something even customers are uncertain about. 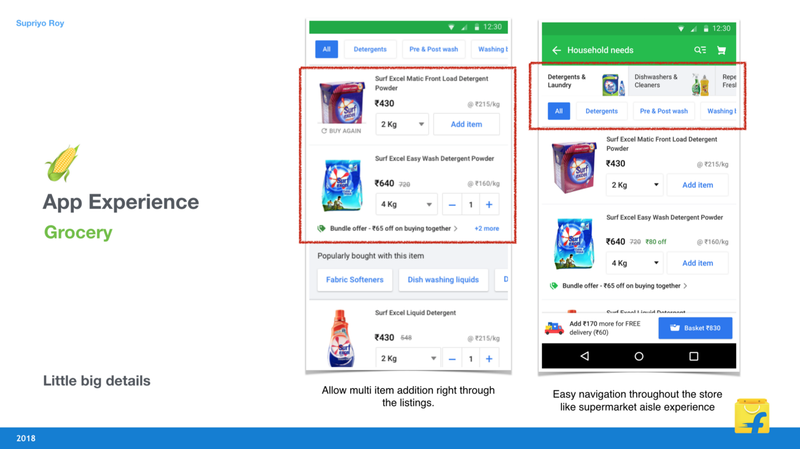 Navigation is one problem in online Grocery shopping that is very beautifully solved in marts with the long distribution of different grocery products arranged in an organized manner with leading to a very simple checkout process. These product categories demand unique experiences. 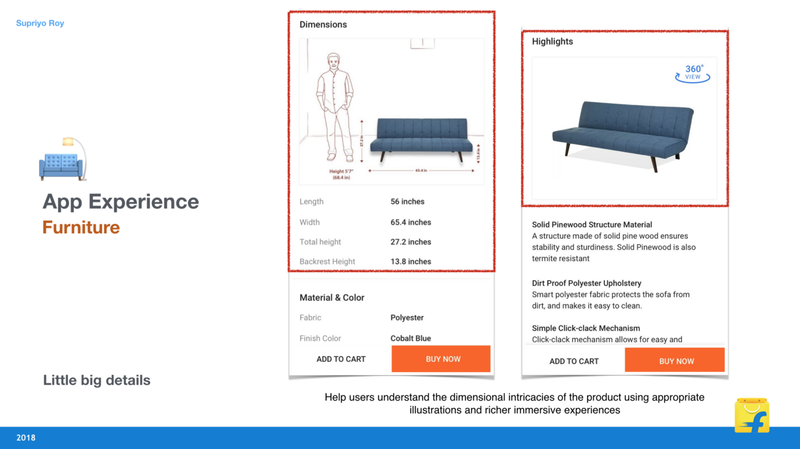 You cannot create a product page and think it can cater to multiple needs. That brings the need to have core UX Pillars. 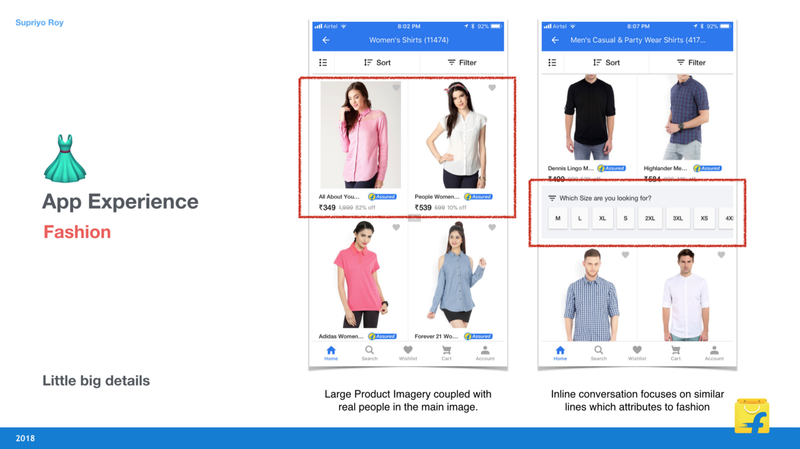 To guide users on how to make their first purchase seamlessly. To play the role of a knowledgeable friend who advises optimal products pertaining to customers tastes and preferences. 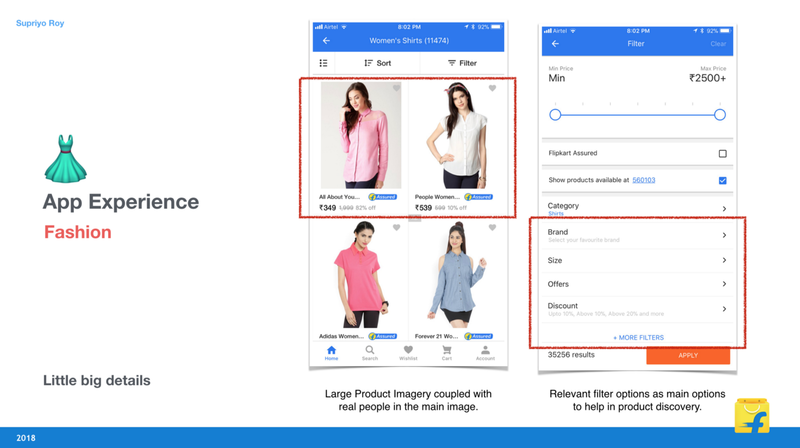 To minimize effort in comprehending and retrieving information during the search, navigation or product purchase decision making phase. Relevance: Users should feel connected while they use the interface. Value Proposition: Users should feel convinced and feel clear about the value proposed through the experience. Usability: Users should not face ambiguity in the experience, they should intuitively understand what to do next. Supriyo stressed that after designing UI it is important to test designs after and before it is launched. This stretches the product launch cycle but this is the right way to do it. Unique needs demand unique experiences. 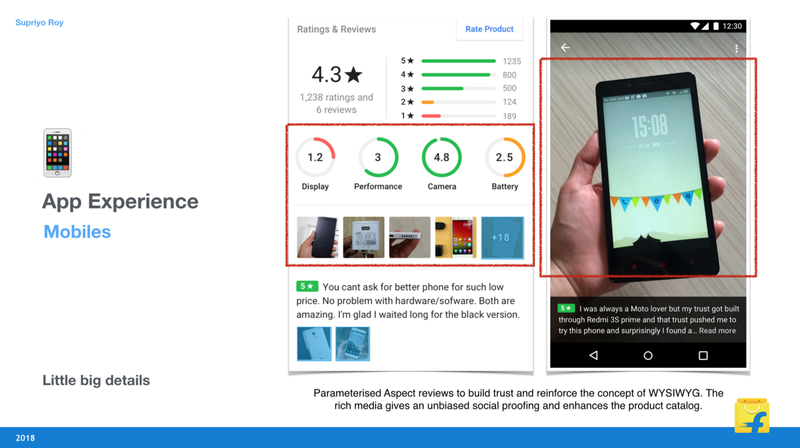 So Flipkart did good research for different needs like mobiles, fashion, furniture, and grocery and came up with different app experience for each of them. The event ended very well with good actionable takeaways. To attend such meetups with me, you can subscribe to www.hellomeets.com. Thank you, Sahiba Sethi, Ayushi Mohindra and Supriyo Roy for guiding me with this blog.